If a shed has poor ventilation, you are more likely to get an accumulation of heat and moisture in a building which provides an optimal environment for bacteria to grow. 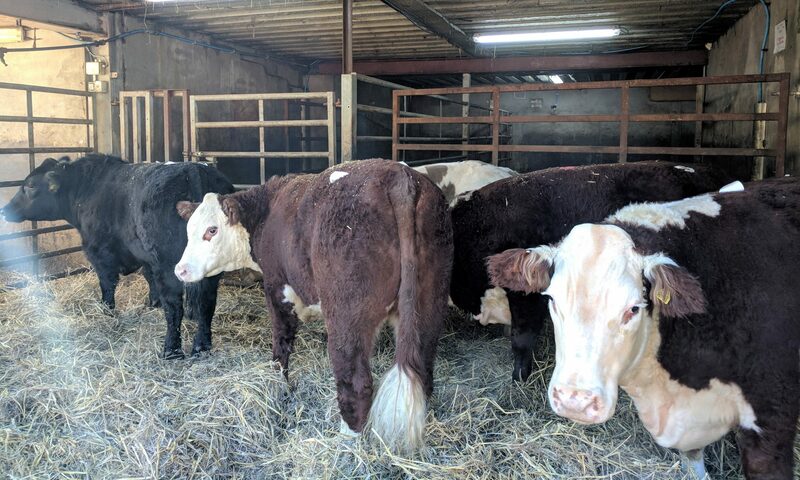 Good ventilation will ensure that animals are breathing in fresh air which can help reduce respiratory issues, but ventilation is only one tool that can be used to reduce the incidence of pneumonia, with vaccination and good husbandry also vital. A good shed design will bring fresh air into the shed where it can collect bacteria, moisture and heat which will then be carried out of the shed. The more air that can be drawn into the shed, the more diluted the harmful bacteria becomes. The shed used in this example is a four-bay single slatted shed with an open front. The shed has a creep and is fitted with vented sheeting above the back wall, up to the eaves. The prevailing wind approaches the shed from the back, hitting the vented sheeting. There are two doors on the creep area of the shed but for this example they were left closed. When carrying out a smoke bomb test, it is important that non-toxic smoke pellets are used. There is no flame when the pellet is lit but it is still important to keep it on a fireproof surface. In this example an old tile was used when carrying out the smoke test. Each of these pellets will burn for about a minute and provide ample smoke to allow you to see how the air flow works in a shed. A smoke bomb test will not always give you a perfect answer as to the air flow through your shed as there can be many contributing factors, not least of which involves the air speed on a given day. The smoke test shown in these examples was carried out on a very calm night where there was very little wind. It is advisable to carry out the test in calm conditions, so you can see how the natural ventilation in the shed works. This will show the airflow in the shed at its worst. It is advisable to carry out the smoke bomb test at animal height when there are animals in the shed as this gives a truer reflection of the air movement and conditions that animals are subjected too. However, farmers should never go into a pen if cattle are easily agitated, such as bulls. Another alternative is to burn the pellets from the creep area of the shed to give an indication of the conditions present. In Welsh conditions, wind movement has a large effect on air flow through sheds. Not only can a smoke bomb be used to see if air is stagnant in a shed but it can also be used to see if it is too quick which could lead to draughts. However, this is generally not as big of an issue as poor air movement. It is vital to avoid draughts, especially with young calves. One thing that is not as prevalent in a calf house is the stack effect as less heat is produced by the calves to drive it. Therefore, you are relying on the wind and the design of the shed to ensure that there is sufficient air flow without causing draughts. When the pellet begins to smoke, you want it to rise up as quickly as possible and exit through the outlet ventilation of the shed, whether it is the ridge cap or through spaced sheeting in the roof. For this to work, ample air must flow in through the inlets on the sides of the shed. If the smoke does not rise but moves quickly along the floor of the shed, this can be an indication of a draught. Upon burning the pellet, the smoke produced rose straight up away from the animals, highlighting that there were no draughts in the shed, but it was clear that the smoke lingered in the shed for a time. The important thing was that even as the smoke lingered in the shed it was still moving and did not gather in any one area. It is important to review the ventilation in your sheds, especially for older buildings that may have been adapted over the years. Often farmers will put down an increased stocking rate in the shed as the reason for an increased incidence of respiratory diseases. However the underlying reason is more likely to be poor ventilation. Having a shed well-ventilated can also add to its lifetime. High levels of condensation, and gases may lead to the corrosion of structures over time. Research from the UK has shown that it is desired that there is a minimum change of air within the building of at least 10 times every hour, this would be much higher in warm, humid conditions. One key aspect of fresh air that is often overlooked is its effectiveness at killing harmful bacteria. Research in the UK has shown that fresh air can kill many bacteria and viruses 10-20 times faster than a mix of half and half fresh and stale air.